What is Barong? Or should we say, who is Barong? The Balinese personification of good fights an eternal battle with the demon queen Rangda. I fell in love with Barong the first time I saw him. And really, who could resist his charm? He’s most often depicted as a bright red, playful creature who gallops along good-naturedly like a playful Labrador retriever. Somehow his bug eyes and fangs don’t detract from his cuteness. While Barong’s name supposedly comes from a word meaning “bear,” it’s difficult to pinpoint exactly what type of creature he is. He looks a lot like a Chinese fu dog, which to me has always seemed a muddling of a lion and a Pekingese. It helps that Barong is essentially all that is good in the world. He protects the Balinese in their villages. Barong is represented by a mask, its dark beard usually made of human hair. The mask is often kept in the village’s pura dalem, the temple of death, or in a small shrine near the bale banjar, the meeting hall. If, for instance, an epidemic rages through a village, the local priest will dip the beard of the Barong mask into a bowl of water, which will imbue it with white magic that will heal the populace. Oil dripping from the mask’s eyes has even been said to cure scabies. His worship predates Hinduism and is a relic of animism, the belief that animals have supernatural protective powers. When I first visited Bali, we arrived in September during the Galungan Festival. 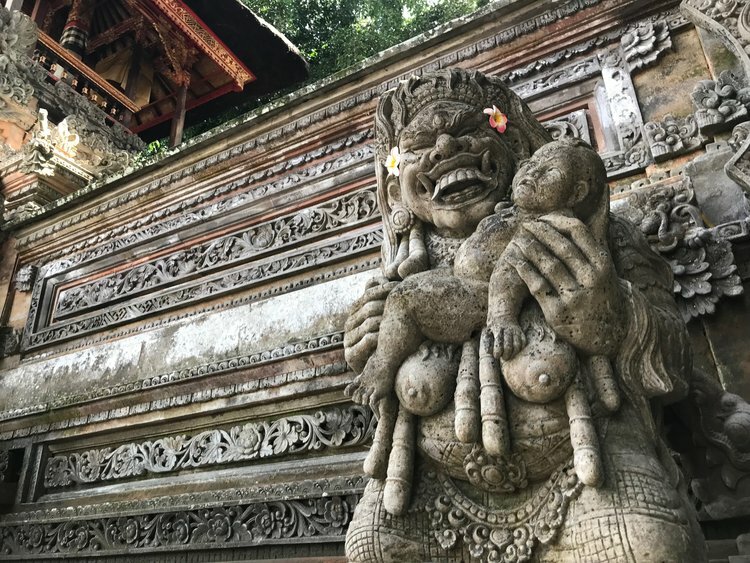 It struck us the Balinese version of Halloween. All through the town of Ubud, we’d hear the clanging of metal percussion instruments, and would gawk as a strange creature approached. This was Barong, its wooden jaw opening and closing with a loud thok. One boy worked the mask, with its golden, mirrored crown, while others hid under a sheet to form the bumpy body that moved jerkily along the street. The kids, in their Barong costume, would stop at various business and receive sweets or coins. We later learned that Galungan was the most holy of holidays for the Hindus of Bali. During the galungan holidays, the island was suddenly filled with magnificent masked beasts. With glaring eyes and snapping jaws, with elaborate golden crowns, great hairy bodies bedecked with little mirrors, and tails that rose high in the air to end in a tassel of tiny bells, they pranced and champed up and down the roads from village to village to the sound of cymbals and gongs, as though they had newly emerged, like awakened dragons, from caves and crevices in which for months they had been lying dormant. These creatures were high-spirited and full of whims, dancing a strange ballet, coquettish and playful one moment, rolling on the ground like a puppy, and suddenly and unaccountably ferocious the next, snapping and stamping in fine fury as the two dancers within the body synchronized their steps and movements with beautiful coordination. As the king of the good spirits, Barong fights a never-ending battle with the demon queen Rangda.